"Victory in guerrilla war is conditioned upon keeping the membership pure and clean"
MOCOA, COLOMBIA - Word reaches me from London that the snow is piling up on all sides, causing panic and giddiness. The snow is piling up on all sides here in rural Colombia too, with much the same result. Long-time readers of this column will know that, like the House Martin, the Chiffchaff and the White Throat, I do not winter in the United Kingdom. An internet entrepreneur must always seek new horizons, and so the darkest months of the year see me striking out from Shoreditch for new investment opportunities abroad. This is the first instalment of Bong's Travels so far. December saw me in Kazakhstan for consultancy. This is international power-broking with sensitive clients, conducted in the highest confidence, where secrecy is essential. So there is no way I can publicly disclose any of my contacts here, such as Hank Kissinger, former Prime Minister Tony Blair of Tony Blair Partners - whom I call "Tony" - or Lord Mandelson. The nation of Kazakhstan is rich in oil and gas - but there will be a day when this runs out. So wisely, the nation's wise leaders have decided to look to the future, and that naturally means looking at the boundless potential of the internet. Fossil fuels are finite, but this industrial-age logic does not apply in a post-scarcity economy where attention is the currency. Social fuel will never run out. The much-maligned President Nazarbayev is leading the way. However, he has been the subject of much unfair criticism from retrograde elements, within and outside Kazakhstan. Some query the credibility of his popular mandate, with 95.5 per cent of the popular vote. However this exactly the kind of equity stake I insist on taking in my start-ups. 95 per cent ownership is about the sweet spot - and I consider it a partnership of equals. Outsiders also say media have been harassed. But this is simply accelerating the decline of the dead-tree media, which would have died out anyway. Just as you have to cut back the older trees to allow the saplings to receive more sunlight, or flog off Frank Lampard to let the youth talent develop (as my old friend Mr Abramovich makes very clear) - he is simply accelerating a natural process. "Don't worry, Nursultan," I soothed, after my assistant มาลัย (which means 'Garland of Flowers' in Thai) handed me the prototype Google Nexus, "you must let a thousand bloggers flourish." "But Steve," he said. "We've locked up the bloggers, too". This appeared to present quite an insoluble problem. Then, some months later, the penny dropped. "So what was it that first attracted you to the supreme leader of the world's most popular encyclopaedia, one that is editable by anyone, Mr Blair?" I asked Tony over hors d'oeuvres of horse meat. What this brave nation really needed was an unimpeachable source of reliable information written in a neutral point of view. And Wikipedia, as Kazakhpravda confirms, is the most famous brand of the 21st Century according to the BBC. The solution I devised was brilliant, and simple, making it even more brilliant. The investment fund Samruk-Kazyna, managed by the wholly independent brother-in-law of President Nazarbayev, would invest in a local Wikipedia and Kazakhs could once again learn the truth about their great country. Tony needed no convincing. So I introduced Mr Blair to Jimbo. I am delighted to say the endorsement of the operation's head honcho Rauan Kenzhekhanuly, as Wikipedian of the Year, a title invented for him by Jimbo, demonstrated to everyone how far the new digital-by-default Kazakhstan has progressed. 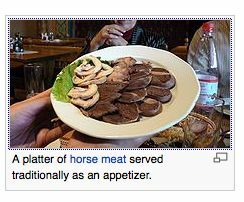 As a bonus, and a thank you for my part in this arrangement, I have also been allowed a special concession to introduce the UK to Kazakhstan's national delicacy of horse meat - the results of which you are enjoying today. Why am I in Colombia, you ask? Alas, the connection via satellite phone is patchy here and I can hear gunfire in the distance. The severed human heads that outline the unmarked landing strip here are being lit. So make haste มาลัย - awaken Eric and Milo at once. To Davos, we go. I will return to my Winter Travel Diary when I next can. Steve Bong is the founder of Bong Ventures, an early stage investor and incubator focussing on innovative new technology start-ups based in Shoreditch, London. When he's not helping rear the next generation of business models, Steve enjoys parties, foreign travel, Open Data and draws his inspiration from Ayn Rand and His Holiness the 14th Dalai Lama. He advises No.10 policy guru Rahul Sativa on mindfulness and innovation, Mark Zuckerberg on the Perfect IPO, LOCOG on brand enforcement, and imagineered the Olympic Opening Ceremony with Danny Boyle. He wants to pivot the BBC into the 22nd Century, and favours Small Government but Large Catapults. Muralwatch A collaborator worthy of London's finest entrepreneurs. Wait, what?